If you enjoyed Midnight, I hear no reason for it to be different with “Seaside”. For this second collaboration, the duo Dart & Dorricott does in the original by offering an impressive collection of 16 original titles which float in the perfumes of an Electronica easy to tame, without industrial nor psybient artifices. In short, a music to which one listens to so well that even my wife loved it! Proposed as much in CD-r as in download, the music is rich of its ambiances with a production in 24 bits which does justice to another chapter of the film Blade Runner. CD1 is entitled; The Human Side and proposes 10 tracks whose cinematographic vision observes the evolution of Deckard and Rachael between both films. "Waves" sets the tone to this filmic vision with noises of waves which get clinging to the rocks. The tone of the synth is quite Vangelis with beams that come and go with a certain degree of intensity. This setting allows the introduction of the piano and its solitary notes which are filled of nostalgia. Soft percussions structure an ambient rhythm, caressed by layers of voices. The piano clings. The tone is in the Lounge genre and depicts pretty well the upcoming moods of “Seaside”. Dominating, the piano of Mark Dorricott is of all the fights. Whether acoustic and electronic, it weaves lines of harmonies, often melancholic and sometimes more joyful, in sonic panoramas which breathe through different forms of rhythms. All very accessible between soft-tempo and a very reasonable down-tempo. Easy Listening, New Age and Sunday morning music are in the spotlight in this double album where the melodies abound over good arrangements. 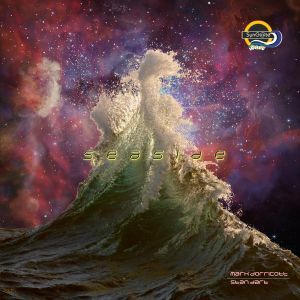 Stan Dart has grasped the melodious dimension of his musical companion and uses it wisely throughout “Seaside”. "Remembering Paris" is a very good example. In doing so, it gives a more unidimensional approach to the music which goes very rarely to more complex tracks. There are good moments of ambience which are very cinematic-intense. I think of "Starlight II", "Stellar Night" and "Time's Right" which are the highlights of The Human Side. "Deckard's Party" is the most danceable title of “Seaside”. And again, it remains very sober. CD 2, The Replicant Side, is much better. I don't understand why the shortened version of Time's Right since it's a solid piece of music. I like the Ambient House style in "Replicant's Dream". The introduction is very orchestral with a well felt zest of cosmos. The arrangements are top notch! We slowly arrive at the rhythm, but once our legs have gotten in, difficult to stop! "Empty Room" is a nice lunar slow-tempo. The rhythm is lascivious, the bass line is to dream with its way to cling to the rhythmic melody and the piano notes crystallize a melody as evasive as a dream. "Memories of Tomorrow" sounds very much heard in the best moments of The Human Side. It's beautiful, but... "Distant Life" is another good title woven on a long line of riffs and where the piano makes clink notes and harmonies in a sonic water crystallized of prisms. Its notes are of a piercing blue and throw spears of emotivity in a race against time which ends in a heavy and dense orchestral rock. It's very intense and it matches some of the good times in Midnight. "Thannhauser Gate" is the jewel of “Seaside”. The music is very intense and dominated by the multilayer harmonies of this piano which seduces both by the agility of Mark Dorricott's fingers, the time in the rhythm and in the emotional power of the arrangements. "Fading (Away)" is a remixed vision of Tears in the Rain, much like in the movie of 2018. I guess that one single album would have been better. But then again, the titles retained must be the good ones! And that depends on the points of view. If you like easy music to whistle, with melodies and structures of soft-tempos guided by piano lines which in the end sound a little bit alike, I believe you will have no trouble with this album. It's nice and well done, I can't argue with that. The sound depth is quite good too, but we are quite far from a progressive and complex EM with breathtaking turnarounds. There are good times and again, they are developed in a lunar and seraphic vision. Si vous avez apprécié Midnight, je n'entends aucune raison pour que cela soit différent avec “Seaside”. Pour cette 2ième collaboration, le duo Dart & Dorricott fait dans l'originalité en proposant une impressionnante collection de 16 titres originaux qui flottent dans les parfums d'une Électronica facile à domestiquer, sans artifices industriels ni de psybient. Bref une musique qui s'écoute tellement bien que même ma blonde a aimé! Proposée autant en CD-r qu'en download, la musique est riche de ses ambiances avec une production en 24 bits qui rend justice à un autre chapitre du film Blade Runner. Le CD1 est intitulé; The Human Side et propose 10 pièces dont la vision cinématographique épie l'évolution de Deckard et Rachel entre les 2 films. "Waves" donne le ton à cette vision filmique avec des bruits de vagues qui s'agrippent aux rochers. Le ton du synthé fait assez Vangelis avec des faisceaux qui vont et viennent avec un certain degré d'intensité. Ce décor permet l'introduction du piano et de ses notes esseulées qui sont remplies de nostalgie. De fines percussions structurent un rythme ambiant, caressé par des nappes de voix. Le piano s'accroche. Le ton est du genre Lounge et dépeint assez bien les ambiances à venir de “Seaside”. Dominant, le piano de Mark Dorricott est de tous les combats. Que ce soit acoustique et électronique, il tisse des lignes d'harmonies, souvent mélancoliques et quelques fois plus joyeuses, dans des panoramas soniques qui respirent par différentes formes de rythmes. Tous très accessibles entre du soft-tempo et un down-tempo très raisonnable. Le Easy Listening, le New Age et la musique du dimanche matin sont à l'honneur dans ce double album où les mélodies abondent sur de bons arrangements. Stan Dart a bien saisi la dimension mélodieuse de son compagnon de musique et s'en sert à bon escient tout au long de “Seaside”. "Remembering Paris" est un très bel exemple. Cela faisant, ça donne une approche plus unidimensionnelle à la musique qui s'évade très rarement vers des pistes plus complexes. Il y a des bons moments d'ambiances qui sont très cinématico-intenses. Je pense entre autres à "Starlight II", "Stellar Night" et "Time's Right" qui sont les points forts de The Human Side. "Deckard's Party" est le titre le plus danse de “Seaside”. Et encore là, ça reste très sobre. Le CD 2, The Replicant Side, est nettement supérieur. Je ne comprends pas la version écourtée de Time's Right puisque c'est un solide morceau de musique. J'aime bien le style Ambient House dans "Replicant's Dream". L'introduction est très orchestrale avec un zest de cosmos bien senti. Les arrangements sont top notch! On arrive lentement au rythme, mais une fois que nos jambes ont embarquées, difficile d'arrêter! "Empty Room" est un beau slow lunaire. Le rythme est lascif, la ligne de basse est à faire rêver avec sa façon de s'agripper à la douce mélodie rythmique et les notes de piano cristallisent une mélodie aussi évasive qu'un songe. "Memories of Tomorrow" sonne comme du très entendu dans les meilleurs moments de The Human Side. C'est beau, mais…"Distant Life" est un autre bon titre tissé sur une longue ligne de riffs où le piano fait tinter notes et harmonies dans une eau sonique cristallisée de prismes. Ces notes sont d'un bleu perçant et lance des pointes d'émotivité dans un genre de course contre le temps qui se conclut dans un lourd et dense rock orchestral. C'est très intense et ça rejoint certains des bons moments dans Midnight. "Thannhauser Gate" est le joyau de “Seaside”. La musique est très intense et dominée par ces multicouches d'harmonies de ce piano qui séduit tant par l'agilité des doigts de Mark Dorricott que le temps dans le rythme et la puissance émotive des arrangements. "Fading (Away)" est une vision remixée de Tears in the Rain, un peu comme dans le film de 2018. Le défaut de “Seaside”! C'est un album double. Un simple aurait été nettement plus judicieux, mais encore là faudrait-il que les titres retenus soient les bons! Et ça, ça dépend des points de vue. Si vous aimez une musique facile à siffloter, avec des mélodies et des structures de soft-tempos guidée par des lignes de piano qui au final se ressemblent un peu tous, je crois que vous n'aurez aucune difficulté avec cet album. Par contre, nous sommes loin d'une MÉ progressive et complexe avec des retournements à couper le souffle. Il y a de bons moments et encore là, ils sont développés dans une vision lunaire et séraphique.